G. E. Hein, “A Progressive Education Perspective on Evaluation,” In B. S. Engel and A. C. Martin, eds. 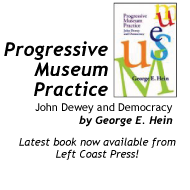 Holding Values: What We Mean by Progressive Education, Portsmouth, NH: Heinemann, 2005, pp. 176-181. G. E. Hein, "The Challenge of Constructivist Teaching," in E. Mirochnik and D. C. Sherman, editors, Passion and Pedagogy: Reflection, Creation, and Transformation in Teaching, Peter Lang: New York, 2002. G. E. Hein, "The Logic of Program Evaluation: What Should We Evaluate in Teacher Enhancement Projects?" in Friel, S. N. and G. W. Bright, Reflecting on Our Work: NSF Teacher Enhancement in K-6 Mathematics, Lanham, MD: University Press of American Inc., 1996. G. E. Hein, "The North Dakota Study Group," Radical Teacher, No. 31, June 1986, pp. 5-10. J. M. Paradise and G. E. Hein, "Impact of Participation in Teacher Center Activities on Teachers' Personal and Professional Development", San Francisco, CA: Far West Laboratory for Educational Research and Development, 1980. G. E. Hein, "Evaluation in Open Education: Emergence of a Qualitative Methodology," chapter in S. Meisels, editor, Special Education and Development: Perspectives on Young Children with Special Needs, Baltimore: University Park Press, 1979. G. E. Hein, "New Schools, Old Habits," The Current, Lesley College, 4, 12-15, Winter 1976. G. E. Hein, "The Science of Watching and Wondering," Urban Review, 9, 242-248 (1976). Corwin, G. E. Hein, and D. Levin, "Weaving Curriculum Webs: The Structure of Nonlinear Curriculum," Childhood Education, 52, 248-51 (1976). G. E. Hein, "Humanistic and Open Education, Comparison and Contrast," Journal of Education, 157, No. 3, 27-38, August 1975. G. E. Hein, "The Social History of Open Education," Urban Review, 8, 96-119 (1975). G. E. Hein, "Standardized Testing, Reform is not Enough," in Testing and Evaluation : New Views, Association for Childhood Education International, Washington, 1975. G. E. Hein, "Piaget, Materials and Open Education," EDC News, 1, 1973. G. E. Hein, "An Interview with Dorothy Welch," Working Paper, Elementary Science Study, Education Development Center, 1969. Reprinted in Open Education, E. B. Nyquist and G. R. Hawes, Bantam Books, New York, 1972. G. E. Hein, "The Impact of 'Stuff' in the Classroom," Education Technology IV, 54 (1969). Reprinted in Technology and Education, L. Lipsitz, editor, Education Technology Publications, Englewood Cliffs, 1971. Contents of this page ©2009-2015 by George E. Hein. Contents may be quoted with proper attribution.